I love this Kimme Winters necklace which I found it at boutique Fortyfiveten. 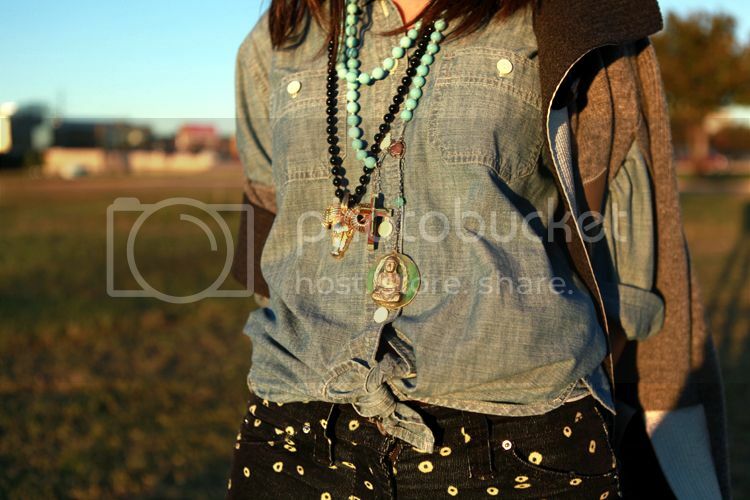 The blue beads, the cross, and the Buddha pendant-these elements make this necklace is interesting. Yes, I thought about giving it a nickname: Diversity, Undecided, Indecision or “Living Buddha, Living Christ” by Thich Nhat Hanh. What would you name it? I paired it with a vintage ram necklace. Jcrew shirt, Isabel Marant fall 2010 pants. 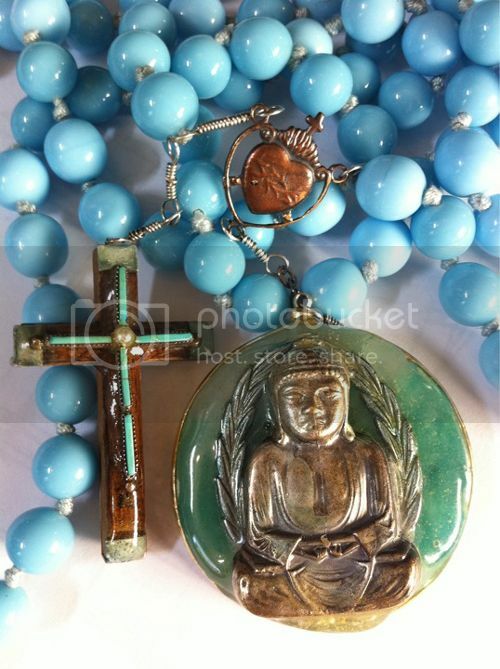 What an unusual way to combine to religions in one necklace, though it looks good I must say! These shoes are killer, and the jeans are super cute on you. Those heels are a killer! Does it hurt to walk in them? What a GREAT necklace!!! Your style is just…perfect! Love this post! Your shoes are jaw-dropping fabulous!!! Your shoes are just stunning. I am always very happy when looking at your outfits. LOVE the Isabel Marant pants!! That necklace is incredibly beautiful. I hope you're doing well. and have a lovely day! the blue coloir is amazing and I love Hanna Berhnards pieces. Just amazing. I trying not to buy a Dreis Van Noten coat with beautiful, stunning colours and fur cuffs with a matching pair of silver heels with gold toe, but as soon as I poop into your blog – I just think I need to own them. We share the same wanting for beautiful things and treat them as arts. the shoes are amazing!!!! hot!!! Necklace is so cool! But shoes are real killers! I was also wondering about the comfort level for the shoes. Glad they're comfy. Great shoes and jeans! 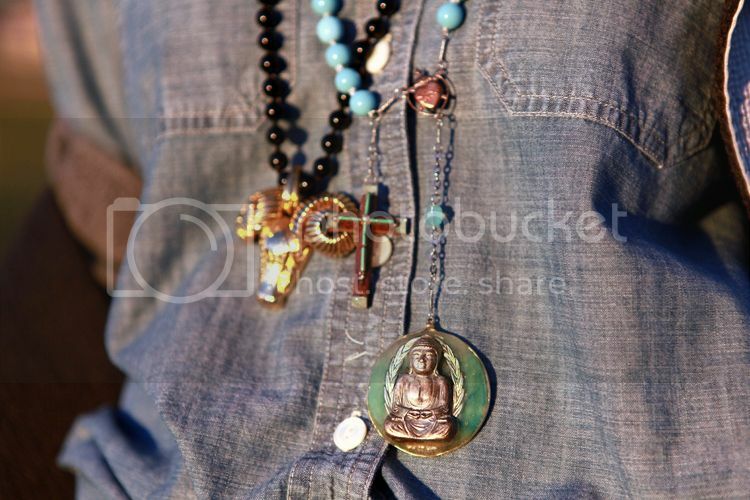 Nice pics.Specially the religious necklaces. 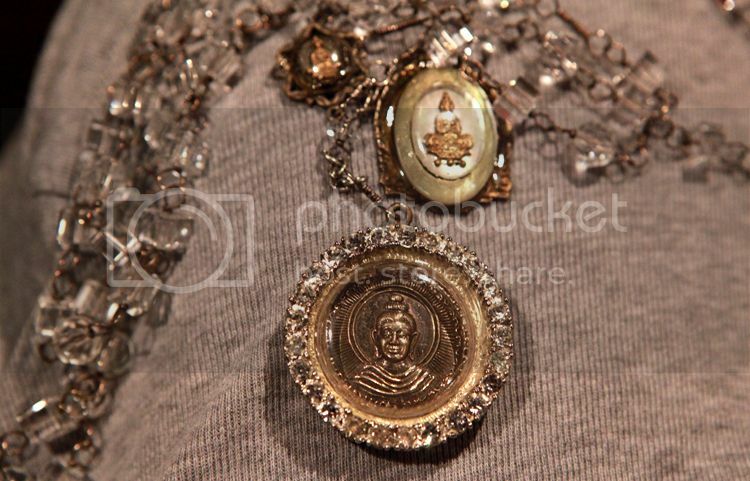 I would probably just call it "Faith" …..
that buddha necklase is so beautiful! I like the way it catch eye and it is so interesting to look at. Very magical. Hey,really very nice post, most beautiful thing is necklace which i like a lot….. thanks for sharing information. jewelry and outfit are great (as is the golden autumn light), but i can't get over your incredible pair of miu miu shoes! I just sent Kimme the link to this post, she'll love to see it. Cute shoes too by the way! The shoes and the pants really look perfect together. I love the whole outfit. Cool! The things you wearing is classic…The shoes are fantabulous….